Welcome to Hustopeče, the heart of vineyards and almond trees! This town, situated in the picturesque countryside near the Pálava and Novomlýnské reservoirs, offers opportunities for active tourism and relaxation in the midst od vineyards and almond orchards. The area of the town of Hustopeče is one of the oldest populated areas in Southern Moravia. The first written records come from the mid 13th century. From the beginning of the 14th century until the end of the 16th century, Hustopeče belonged to the monastery of the Aula Regia in Brno. The of year 1572 represented a significant milestone when the Emperor Maximilian promoted Hustopeče into the rank of cities. In the 16th and 17th centuries, the strategic position at the border of three countries made the city an important stop on the so-called Hungarian road. From the year of 1599, Hustopeče belonged to Lichtenstein family, which ruled it until 1848. Then it became the seat of the political and judicial district. On October 8, 1938, as a result of the Munich agreement, the city was occupied by Nazi troops. The judicial and political district of Hustopeče was restored after the end of the World War II. During the reorganization of the state administration of Czechoslovakia in 1960, the city was added to the district of Břeclav. Since 2003, it once again performs the function of administrative centre of the region. You can visit a number of events in the town during the year. Most of them are connected with the wine culture, while others are focused on sport. One Saturday in March is dedicated to the almond trees, and almond and wine festivals are held regularly. Visitors can go on a guided walking tour through the orchards. Restaurants offer almond menus, and wines from local winemakers and the renowned Hustopeče almond brandy is another great attraction. The first weekend in October in Hustopeče is annually dedicated to federweisser. Federweisser festivities transport the city to the Middle Ages. Ladies, esquires and knights in historic costumes can be seen at every turn, and the federweisser doesn't stop flowing. It is poured in so-called mázhouses (tap rooms) in passageways to the square. During these days full of fun and laughter you will get to know real Moravian hospitality and ease. Worthwhile events with a wine theme include the St. Martin's Wine and Goose Celebration (November), Almond and Wine Festival (March) or the unique exhibition World Wine Duel (November). Popular sports events include Wandering through the André Region (June), which combines wine and cycling, or Jumping in Hustopeče (Hustopečské skákání). Sport lovers can also enjoy a multi-purpose sports hall, indoor swimming pool and an outdoor summer swimming pool. 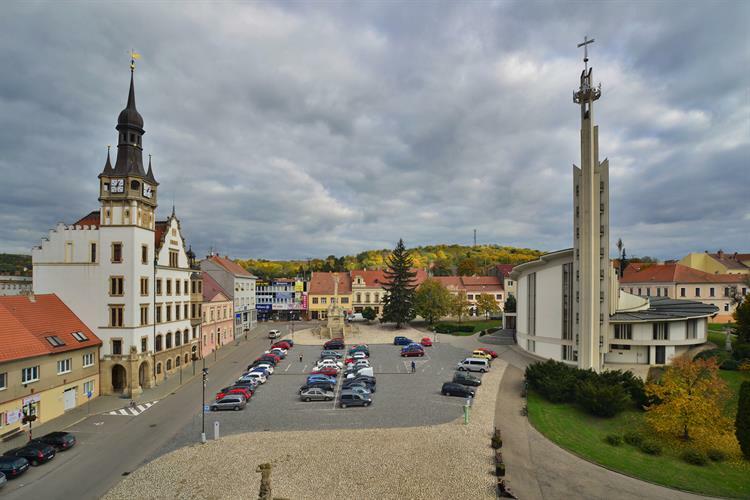 The town centre has two dominant features: a neo-Renaissance town hall from 1906 and the modern church of St. Wenceslaus and Agnes od Bohemia from 1994. Besides them, the main aquare (Dukelské Square) features a fountain from 1595, baroque plague column and above all the Renaissance House U Synků from 1579. You should not miss the opportunity to visit the Permanent Wine Exhibition. The town has always been closely linked with viticulture. It is obvious both from the oldest seal of Hustopeče 1322 with viticultural symbols and also from the fact that the feared Horenský court was active there. In the 16th and 18th centuries, Hustopeče became the largest municipality of Moravia due to its acreage of vineyards. Together with Mikulov and Znojmo, Hustopeče formed a trio of major centres of Moravian viticulture. Today, you can find two wine-cellar lanes in the town – the streets Vinařská and Na Hradbách, where you can visit any number of wine cellars.